Marketplaces and prices shown matched UPC number 010343943568 during our search. Preserve what’s priceless with the FastFoto FF-680W — the World’s Fastest Personal Photo Scanner (1). Scan thousands of photos — as fast as 1 photo per second at 300 dpi (2). SafeTouch Technology offers worry-free scanning for virtually any size, including postcards and Polaroid photos. Second-generation Epson FastFoto Software makes everything easy, with convenient photo editing and smart file organization tools. Offering the ultimate in versatility, the FF-680W features a variety of modes for quick sharing, archiving and enlargements — plus documents, too. Additional features include Easy Auto-Upload to cloud services (3) and Single-Step Technology for 2-sided scanning. 1. As compared to other personal/consumer photo scanners, generally defined as photo scanners priced under $1,000 USD (MSRP). 2. Based on average speed from start of scan to end of feeding, scanning thirty-six 4" x 6" photos at 300 dpi in landscape orientation. 3. Internet connection and active Dropbox or Google Drive account required. 4. Interpolated resolution is the doubling of the optical resolution using a software algorithm to increase dpi. 5. Based on letter-sized scans at 300 dpi in Black-and-White, Grayscale or Color Mode, using the USB interface. 6. 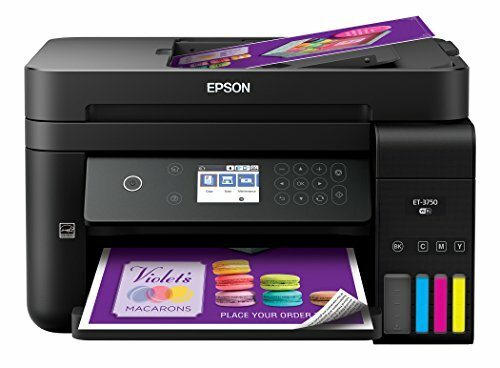 Wirelessly scan, scan to the cloud, PCs or Mac with Epson FastFoto software and Epson ScanSmart software, installed on the connected Windows PC or Mac; wirelessly scan to smartphones or tablets (Android/iOS devices) via the Epson DocumentScan App. Internet access required. 7. For convenient and reasonable recycling options, visit our official site. 8. SmartWay is an innovative partnership of the U.S. Environmental Protection Agency that reduces greenhouse gases and other air pollutants and improves fuel efficiency. Quickly scan priceless photos and preserve them for future generations using this scanner. 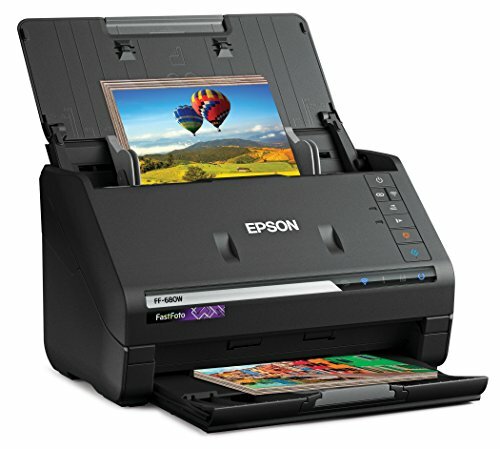 The automatic document feeder lets you load up 36 photos to scan them into your computer or the Cloud, while Epson FastFoto software provides you with the tools to restore, organize and share images with family and friends. 50 to 1200 dpi resolution for crisp, vivid photos and documents. Features 24-bit external color depth with 8-bit external grayscale depth. Scans up to a maximum size of 8.5in. x 240in. (215 - 240in. at 200 dpi maximum resolution). Can scan photos measuring 3in. x 5in., 4in. x 6in., 5in. x 7in., 8in. x 10in., Polaroid photos and panoramic photos up to 8.5in. x 36in.. 4in. x 6in. landscape photo scan speed of 80 ppm and letter-size document scan speed of 45 ppm. 7 operation buttons for simple 1-touch use. Automatic upload and backup to Dropbox and Google Drive. SafeTouch technology makes it easy to preserve your priceless photographs. Use auto enhancement, color restoration, red-eye reduction, de-skew, crop and rotate tools to breathe new life into old photos. SuperSpeed USB 3.0 connection. Wireless 802.11b/g/n connection lets you scan to devices on the other side of the house or office. Epson FastFoto software makes it easy to take control of your photo collection with scanning, restoring, organizing and sharing tools. Epson ScanSmart software features OCR, so you can scan receipts, tax records, wills and more. Backed by the manufacturer's 1-year limited warranty. 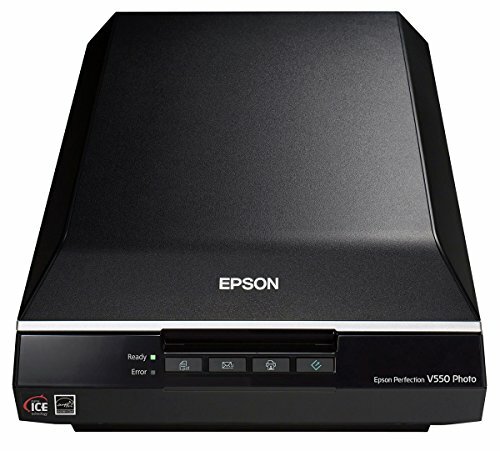 Epson(R) FastFoto FF-680W Wireless Color High-Speed Photo And Document Scanning System, 6.9in.H x 11.7in.W x 6.7in.D, B11B237201 is one of many Scanners available through Office Depot. 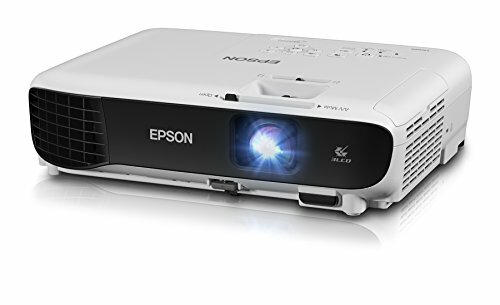 Made by Epson.